I was dimly aware of a belt of mountains running down the spine of peninsula Italy called the Apennines, but I’d never given them much thought until four months ago, when Edita started working in Rome and we discussed what to do on weekends that didn’t involve looking at ancient ruins. 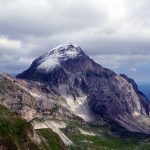 “There’s a mountain called Gran Sasso near here that people have told me about, but I don’t know much about it,” she said. When I got home I Googled it, and discovered Gran Sasso to be not just a single mountain but a whole massif, with a number of peaks rising to over 2000m in height. The highest, Corno Grande, is an impressive fortress of rock 2912m high. Or to put it another way, it’s more than twice as high as Britain’s highest mountain, 1344m Ben Nevis, and less than two hours’ drive from Rome. For a brief second I wondered what on earth I was doing living in London, until I remembered I can’t speak Italian. Even so, I was suddenly quite excited. In the photos, Corno Grande looked like it might be quite a tricky rock climb, but it had to be worth researching in more detail. At the very least there were likely to be easier peaks and some scenic hill walking nearby. 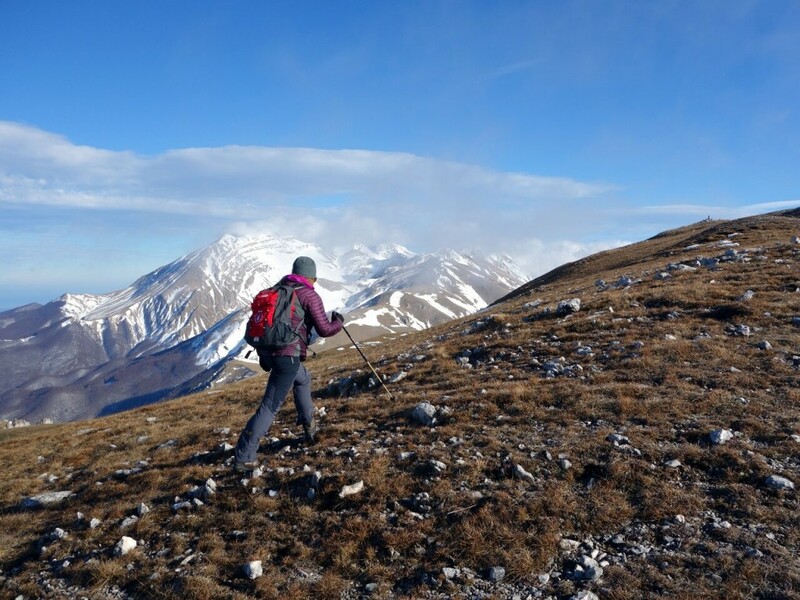 My research led me to the Cicerone guidebook Walking in Abruzzo, which covered not just Gran Sasso National Park, but three more mountainous parks in the Central Apennines, all a similar distance from Rome. From The Map Shop, a mail order retailer based in Worcestershire, I was able to obtain five 1:25,000 maps of the area, almost as detailed as Ordnance Survey Explorer maps. They contained WGS 84 grid lines and were marked with a network of footpaths, making navigation significantly easier. 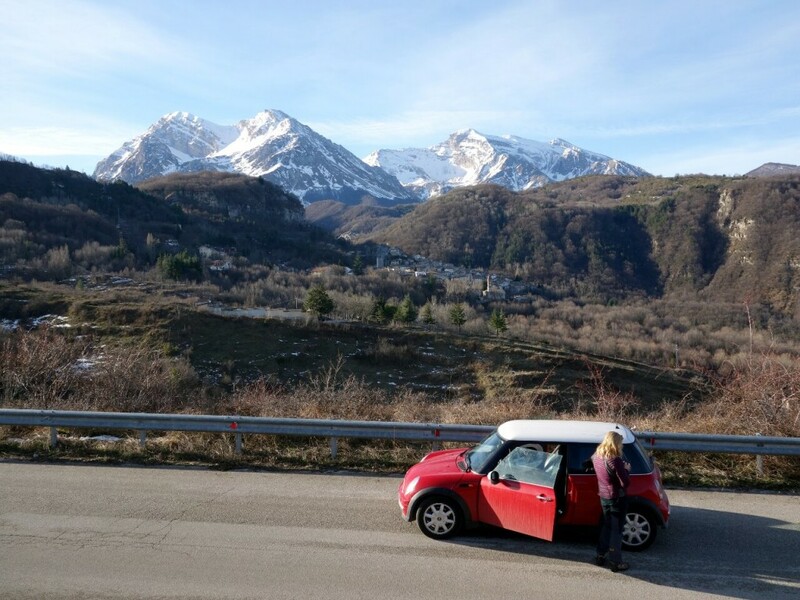 With Edita’s Mini Cooper and her grasp of Italian, we were sufficiently equipped to jump in the car and head to the hills for a few days with as much confidence as I would a walking weekend here in the UK. 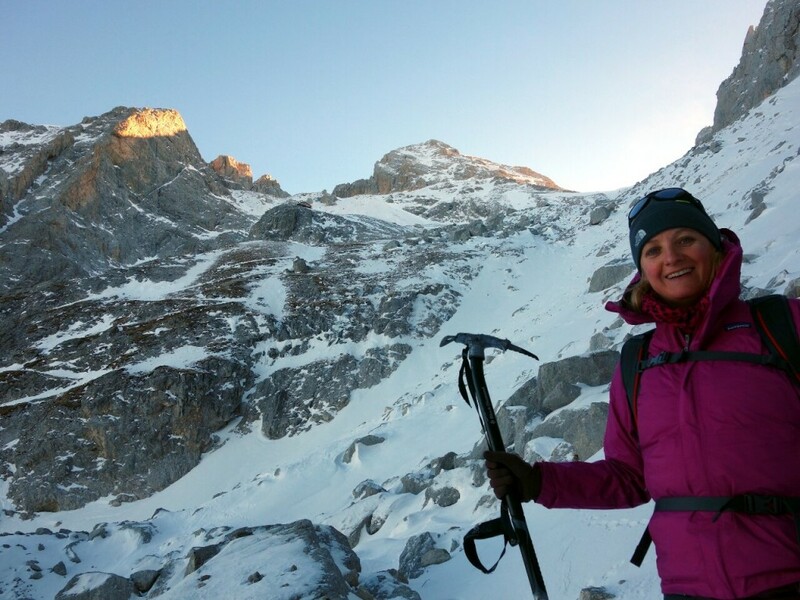 With her boots and crampons still in Kathmandu, Edita had only a pair of microspikes for her feet. Would they be enough? Well, almost. 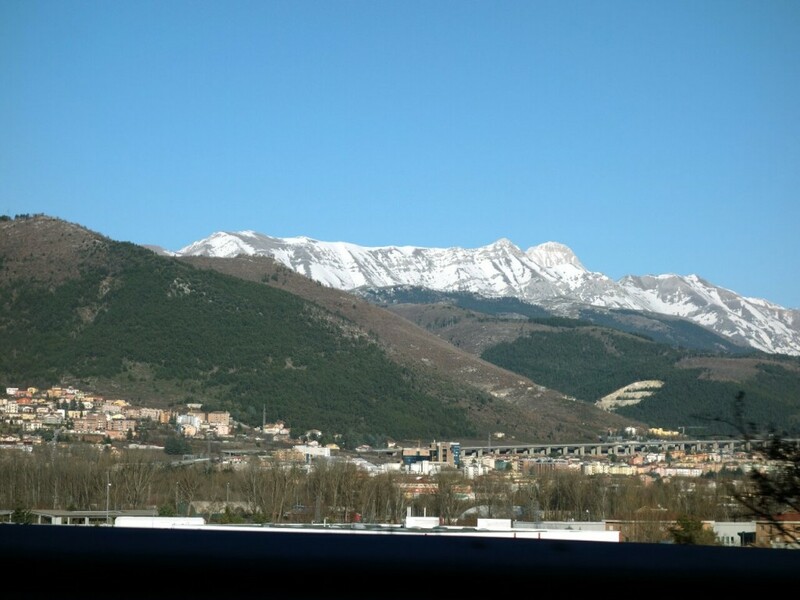 According to the guidebook the snow line in Abruzzo descends as low as 500m in winter. All of the walks in the book were described as snowbound in January, and it even suggested the snow was so deep that snowshoes might be beneficial. Unfortunately Edita’s boots and crampons are still in Kathmandu from our expedition to Lhotse last spring. The only suitable footwear she had in Rome were a pair of fabric walking boots, not rigid enough to take crampons, so I brought her a pair of Kahtoola Microspikes in the hope they would be sufficient for us to get up a hill or two. 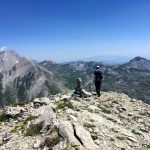 In any case we didn’t know for sure what to expect from the conditions, so while we had ambitions to climb Corno Grande at some point, we expected our first visit to Gran Sasso to be just a reconnaissance. We would assess the lie of the land for next time around, and if we managed to get up an easy peak we would be very happy. Rome is famously built on seven hills, though you have to drive east for about 50km before you start hitting the fringes of the Apennines. When you consider peninsular Italy is only 250km at its widest and the Apennines run all the way from the toe of the boot up to the groin, where they merge into the Alps in the northwest corner of the country, you realise pretty much everywhere in Italy is within easy reach of good-sized mountains. There were clouds on the tops when we approached L’Aquila, Gran Sasso’s gateway town, and we couldn’t see that Corno Grande rose above it like a fluted dome at the end of a snowcapped ridge many miles long. We turned off the main highway and headed north on a winding, but good quality asphalt road that climbed in zig-zags into the heart of the range. Snow became thicker by the roadside, but the road itself had been well gritted and was free of ice. 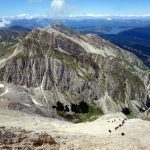 I had chosen 2132m Monte San Franco as our first peak, because from the map I could see its summit could be accessed easily from the road by means of a gentle ridge. I was able to count the bends until we reached a lay-by at the foot of the trail. The sky was beginning to clear with hints of blue overhead, but the ridge lay deeply in cloud, and it looked like it wouldn’t be long before we climbed into it. Straightaway we were walking on snow, and although the path was distinct to begin with, it meant unless somebody else had been up the hill before us and left footprints, we would lose the trail pretty quickly and have to make our own. This happened within half a kilometre of leaving the car, when we climbed steeply for about a hundred metres and emerged into a grassy amphitheatre scarred by power lines overhead and the abandoned buildings of a former quarry. Pine woods lined the fringes of the quarry and I could see we needed to climb above them to reach the ridge, from where navigation would become easier as we followed it to the summit. I picked out a route between copses but quickly became exhausted breaking a trail through snow up to a foot deep. On the edge of the woods Edita took over the lead and not for the first time in our travels moved much more quickly. The route I had chosen wasn’t ideal, and it was clearly not the main trail. We had to traverse steeply across the side of a rocky hillside, but thankfully the wind had taken much of the snow away and it was nowhere near as deep as it was in the floor of the amphitheatre. We were both concerned about the clouds above us, and I stopped to take a GPS waypoint to help us down should conditions worsen. When we reached the ridge we saw it was completely scoured of snow, and the walking was up easy grass slopes. We still had about 500m of ascent, and as we put our heads down and pushed on into the wind and clouds it was looking like our first peak in the Apennines would be more of a tick in the box than a reconnaissance. Our one consolation was that it was a dry mist. In Britain walking into clouds up a hillside like this would mean being coated in a film of water, but here it was just cold. We were in for a lovely surprise. As we climbed we saw more of the view behind us to the north, and gradually the sizeable V-shaped lake of Lago di Campotosto appeared far beneath us. It was definitely clearing, but one thing we weren’t expecting to see that day was a view of snow-capped mountains, and we both gave a shriek of delight when we glanced to the left and found ourselves looking into a snow-clad valley skirted by the picturesque summits of 2623m Monte Corvo and 2635m Pizzo d’Intermesoli. It’s true, we thought we were looking at Corno Grande, and we only realised later it was hidden behind them, but this didn’t make the view any less pleasant. The broad grassy ridge rose in waves, and often we reached a plateau in the clouds where snow lay more thickly only to find the terrain rise again the other side. But the summit was obvious when we reached it, and was marked by a giant wrought-iron cross. The clouds were thinner now. It was very cold in the wind, but we decided to stay on the summit for a while to wait for the intermittent views of mountains as clouds swept past. I was also happy to experience my very first Brocken spectre, a curious phenomenon when your own shadow appears beneath you surrounded by a rainbow. On steeper slopes it can look gigantic against the land far below. Ours was only very faint on the grass beneath our feet and we nearly missed it, but it provided some brief excitement. Our reconnaissance was going better than we expected. It was only our first afternoon, and already we had bagged a 2000m summit, albeit an easy one, and looked east to Gran Sasso’s higher peaks. Walking boots and trekking poles had been quite sufficient, and although there was more snow higher up it wasn’t anything like as deep as we were prepared for. The trails were not so clearly marked, and we hadn’t seen a soul on this one. We couldn’t rely on being able to follow the footprints of others, but our climb had given us the confidence to believe we could take a shot at Corno Piccolo, Corno Grande’s near neighbour, if conditions were clearer the following day. The standard route up Corno Grande and Corno Piccolo starts from a cable car station called Campo Imperatore on their southern side, but we decided to climb from the north, starting at the ski resort of Prati di Tivo. We chose this for no other reason than because the hotel Edita booked while Googling from a coffee shop en route from Rome was that side of the massif. We were the only people staying at our hotel, the Ponte Rochetto near the village of Aprati at the bottom of a deep forested valley, and had to eat what we were given rather than choosing from a menu, but the food was good and the staff were friendly, and they had a fine selection of local Abruzzo wines, so we were happy. It was equally deserted up at Prati di Tivo. The cable cars and chair lifts were motionless, the dozen multi-storey hotels looking up at the north face of Corno Piccolo were ghostly, and a single cafe was open, blasting out music from a speaker outside the door in the vain hope the missing masses might suddenly show up. We’d had a very enjoyable drive up there, with a couple of false starts after picking roads up from the valley which turned out to be closed. The eventual route through was the road with the most hairpins on the map, making its way up a seemingly impossible hillside in tight knots. We were blessed with magnificent views on a crisp, clear day that couldn’t be better for climbing. 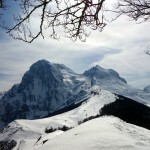 Three isolated mountains rose above the forest: the rocky fortress of Corno Grande and Corno Piccolo, and the two gentler-looking snow ridges of Pizzo d’Intermesoli and Monte Corvo. We looked to have chosen the hardest of the three, with only a wide couloir between the twin peaks offering the hope of a route up. The road above Prati di Tivo was closed by deep snow, so we had to park at the ski resort and walk up. 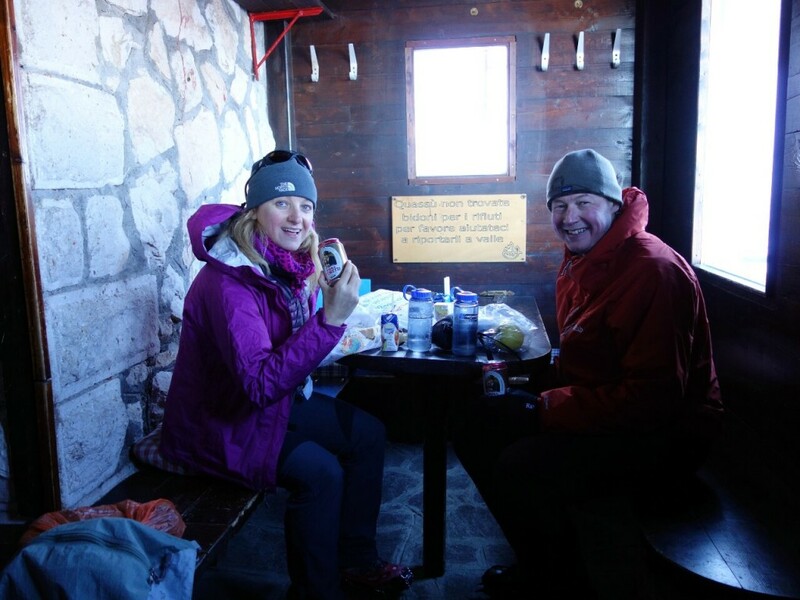 This gave Edita a chance to find out from a mountain guide in the cafe that Corno Grande was considerably easier than Piccolo, a walk up in the summer months. He said it was in very good condition, though at this time of year it would certainly require some mountaineering. We were encouraged rather than deterred, and switched our objective to the higher peak, though the false starts for road closures and stops for photographs meant it was now 11 o’clock. With only 7 hours of daylight remaining and starting from 1450m now, we only had a remote chance of climbing all the way to the top and getting down again safely in winter conditions, but we would see how high we could get. Despite this Edita set off up the snowbound road at such a pace she clearly still had eyes on the summit, and I struggled to keep up. After less than an hour we reached the end of the road, and towards the top we climbed more steeply to reach the crest of a hillside. Here we found we had reached the eastern edge of the Apennines and could look down on the Adriatic Sea a short distance away to the east. The two turreted Cornos now rose up dramatically to the south with the sun right above them. Snow gullies scoured the couloir between the two peaks, any one of which could make for a route up to the col. I put on my crampons and Edita her microspikes, as we climbed up onto a ridge which led to the foot of the couloir. We followed the trail of someone who had been wearing snowshoes, but the snow was firm and crisp now and easy to walk on, and there was no need for tennis racquets on our feet. It was wonderful walking along the ridge with the mountain up ahead of us – a real roof-of-the-world feeling, with everything below us on three sides and many distant peaks on the horizon. We passed a derelict stone building and continued onto the cable car station, La Madonnina, at 2000m at the foot of the couloir. We expected there to be signs of life, but it was deserted, and for the second day in a row we seemed to have an entire mountain to ourselves. If this were the highest peak in a range in the UK there would be plenty of walkers at any time of the year, and in the ski season it’s probably the same here, but where were the skiers and walkers now? We didn’t know and didn’t care, so happy we were to own the north side of the mountain. Above the cable car station we passed rocky terraces built for tent pitches and we angled left into the couloir, where the route steepened significantly and we took out our ice axes. To begin with the going was straightforward with a couple of snow traverses, and although it was exposed to our left there was no cause for concern. But as we climbed more steeply into the couloir the snow conditions, which had been excellent until now, began to change. The couloir was relatively sheltered from the wind, but it must have been billowing over the col high above us and bringing drifts of snow onto our route. 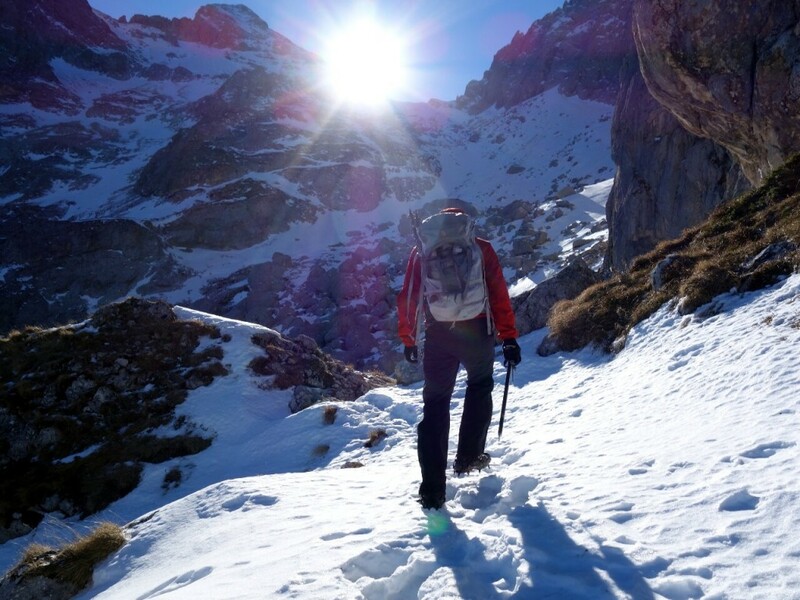 The surface became powdery and no longer as firm underfoot, and while it was not a problem for me in my crampons, Edita was finding it harder with her much smaller microspikes. 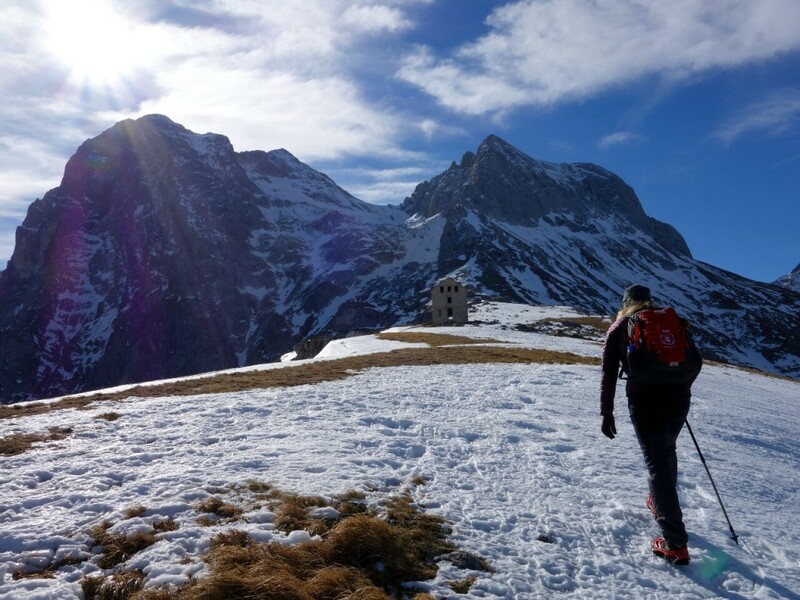 With three 8000m summits to her name she is hardly a novice in these conditions, but while the spikes provided good grip on firm snow, on the powder she felt like she was climbing in gripless walking boots. When we traversed upwards across a slab of powder, she became increasingly nervous of falling off the slope, and without a rope to tie us together we held each other’s hands instead. This isn’t a recognised alpine technique and wouldn’t have helped much had either of us fallen, but it gave Edita a little more confidence until we reached the end of the traverse and found footsteps on firmer ground the other side. The delays ended any slim hope of reaching the summit, but we thought if we could make it to the col between the two peaks it would be a successful reconnaissance. As we climbed higher we left the shelter of the couloir and the wind became stronger. What looked like the col turned out to be a false horizon as the terrain levelled into a basin before climbing again. We looked up and saw a hut at the top of the couloir, and decided to make that our target for the day. We had to wade thigh deep in drifts of snow to get there, with the wind howling around us, but we were rewarded when we reached the sanctuary of a wooden balcony by the door. The Refugio Franchetti lies at 2433m just below the col between Corno Grande and Corno Piccolo on their northern side. Directly above it rise the three main summits of Corno Grande: Orientale (2903m), Centrale (2893m) and Occidentale (2912m). All three look to be serious rock climbs, but we know the highest of the three is a walk in good conditions. The view from the balcony of the hut looks across the couloir to Corno Piccolo (2655m), which rises up in a series of jagged towers. These look even more technical, and although they are certainly harder than Grande we are told the highest of them is a scramble rather than a climb. I sat down on a bench outside the door and started unpacking my lunch. It didn’t occur to me the refuge might be open, but Edita noticed the giant bolt on the door didn’t appear to be padlocked. We fiddled with it for a moment and found ourselves in a stone anteroom, with a small table, benches with cushions, and a stub of a candle that had almost melted down. The inner sanctum of the refuge was locked, but it’s clear the owners keep this part open as a haven for people like us, and even bigger fools who find themselves benighted up here. We were grateful for its shelter as we settled down to eat our sandwiches. With the wind billowing over the col it was bitter when we left the warmth of the refuge to head back down. For the first 50m my hands were like icicles until we found a large rock to shelter behind while I warmed them up again. Our footmarks had become covered by fresh snow, and the traverse was even more treacherous for Edita. It was a painstaking crossing as I walked ahead of her stamping out new steps in the snow, and in the looser sections I walked a metre below, holding her steady as she stepped down into them. 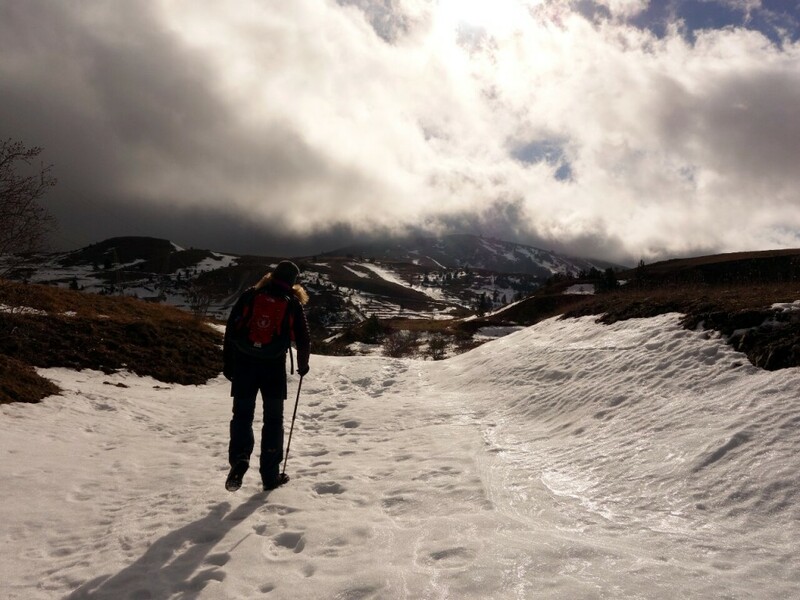 I felt perfectly safe with my axe and crampons, but it was obvious microspikes are no substitute, and effective as they are on icy trails and firm snow, they are not suitable for winter climbing. It’s the first time either of us have used them, and you live and learn. It was a relieved and happy Edita who reached the bottom of the couloir, and we relaxed to admire the view. The sky was dimming and Corno Grande cast its shadow across the lowlands to the north, overlooking the Adriatic. A purple glow caressed the top of Monte Prena to the east, but the setting sun was hidden behind the northern faces of Corno Piccolo until we left the couloir. At the cable car station we stopped and opened the tin of Birra Moretti I had been carrying in my pack. It hit the spot. Although we hadn’t reached the summit we were more than happy with how the day had panned out. We felt like we’d had a real adventure, and it was turning into a successful reconnaissance for sure. It was a beautiful walk in dimming light back down the ridge. We walked in darkness along the forest road to Prati di Tivo, and the night was full by the time we reached the car at 6.30. Back at the hotel that evening the proprietor told us winter was over sooner than usual, and there is often eight feet of snow this time of year. This was how he described it, which means they are not expecting the ski season to return. In the UK winter is rarely over in January, and there is always a chance of more snow on the hills into March. Some time in the next few months we hope to return to Gran Sasso, perhaps to climb both Cornos in a single day. Whatever the conditions, it won’t be done in microspikes. The following day we completed a gentler walk through forest in the deep gorge of the Arno valley which cuts a groove between Corno Piccolo and Pizzo d’Intermesoli. We got lost in the narrow maze of streets and alleys in the village of Pietracamela, which clings to the mountainside on a remarkable clifftop perch. It’s amazing the village doesn’t fall off, but the pine forests all around it guard against landslides to some degree. Our reconnaissance was over; it had been successful, but most of all it had been thoroughly enjoyable. We’ve only scratched the surface of the Abruzzo region, and look forward to exploring much more of it in the coming months. It’s a hill walkers’ paradise there, with attainable mountains even in the depths of winter. We were probably lucky with the weather on this occasion, but even so I’m guessing it’s a lot more reliable than it is in Scotland. As usual you can see all my photos from the trip in the travel photographs section of this website. I love your pictures by the way, all of them! Thanks, Elena, glad you like the post and the pics. Not famous outside Italy, but they deserve to be. Amazing for sure, and I can’t wait to explore more of them!